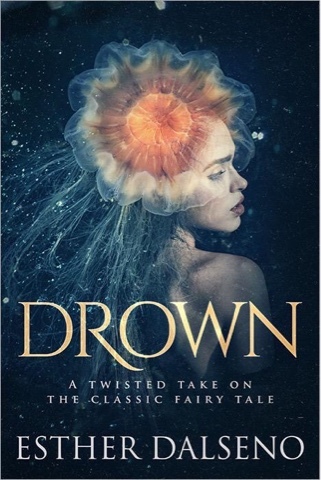 Mad For Books, Luv: Drown by Esther Dalseno RELEASE! I have some very special news! The title to this post pretty much gives it away! but keep reading, it gets even more interesting, I promise! As you may know! I am a huge fan of Fairy-Tale re-Tellings. I love anything that has to do with re-tellings of classic Disney princesses or princes. But you aren't here to read about what I like, no! you're here to hear about the lovely new book and amazing, sweet, awesome author Esther Dalseno! ~What made you want to start writing? Esther- I started writing when I was a child. I quickly learned that books were my greatest pleasure and immediately began trying to create my own. I finished my first novel, which was a direct plagiarism of Star Wars, in grade 6. ~How long did it take you to write 'Drown'? Esther- it took 6 months to write Drown. I wrote it in a beautiful little country called Laos in South East Asia. I'm Australian, but I left Sydney nearly 10 years ago and have been traveling ever since. I am a big scuba diver, and the atmosphere under the water when diving in countries all around South East Asia really influenced the pacing and dream like quality of Drown. When I say down and wrote it, after a failed relationship, I was quite alone with only my dog. My motorbike and my manuscript. ~What was the HARDEST part of writing your book? Esther- The hardest part of writing Drown were the negative voices in my own head, asking me what the point of writing was, and what I intended to do with it, and that it would never amount to anything. They didn't come often but when they did, it would floor me. But I conquered my doubts and finished anyway. Esther- I have always considered myself a writer (although too shy to introduce myself as such.) I undertook a prominent creative writing degree in Sydney and was surrounded by other writers. I quickly found that a lot of my peers considered being a writer sitting in a fashionable cafe with a moleskin notebook, pretending to be writing by looking thoughtful, but not writing a word! Or reading certain literary publications that bored me to death. Or quoting obscure writers (in other languages, even better!). I couldn't bear it. To me, if you put pen to paper, your fingers on a keyboard, and a story comes out, no matter who does or does not read it, then you are a writer. ~Is Drown a stand-alone or a series? ~If you could choose, which writer would you consider a good mentor? Esther- Mentors would include Susannah Clark of Jonathan Strange and Mr. Norrell, Gabriel Garcia Marquez and Haruki Murakami who is a god among kings. ~What does your writing process look like? Esther- My writing process starts early in the morning and involves editing, editing, editing. Then I write half a chapter to one chapter. I need to do it in absolute silence because I find music influences the tone and pacing of my narrative. ~Do you plan to write more stand-alones? or a series? Esther- Early next year, my next novel 'Gabriel and the Swallows' is due for publication. It as a sequel, but only one. ~Do you have anything specific you'd like to tell your readers? Now for the 'more' special surprise! Esther Dalseno had said above that she has another novel that will be 'due for publication' early next year. 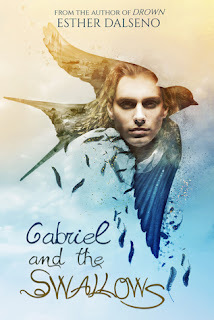 And as it says above it's called "Gabriel and the Swallows" but there's more to this surprise! The synopsis to this story will be below, yes the Synopsis! One-Wine scented Italian night, loner farm boy Gabriel Laurentis rescues a wounded creature, a miraculous young girl with the wings of a swallow. Badly bullied and dwelling in an imaginary world, Gabriel's only friend is the beautiful and mysterious Orlando Khan, followed everywhere by an unexplained flock of swallows. As Gabriel wrestles with manhood, questions haunt him: is the foundling really who she says she is? Who is the Dark One that lurks in the ancient tunnelts beneath their city, or is he just a figment of Gabriel's imagination? And is the girl's condition merely a mutation of nature, or something much more sinister? Gabriel encounters mysteries as old as blood and bone, of ancient rites and foreign lands, and must make a deadly decision that changes the course of life as he knows it. Esther Dalseno was born in a rural Autralian town that is not quite the outback. Returning to Australia after spending her formative years in the USA, she left Sydney in 2007 to become an English teacher in South Korea. She told everyone she would be back in a year. She is yet to return. Esther has lived in Laos, Vietnam and Thailand and has traveled the world extensively. She now lives in Berlin with her husband, daughter, and perkigese dog, all acquired along the way. She was previously published in acclaimed short story collection, We All Need a Witness, by Pan Macmillan. Her second novel, Gabriel and the Swallows, is due for release in 2016.